A home owner in Clinton, NJ, put this piece of red cedar at the curb on a brush clean-up day. Guess who claimed it? “One man’s trash….”as they say. New Age thinking has it that through meditation, one can slip between the spaces in thoughts and access the eternal realm. 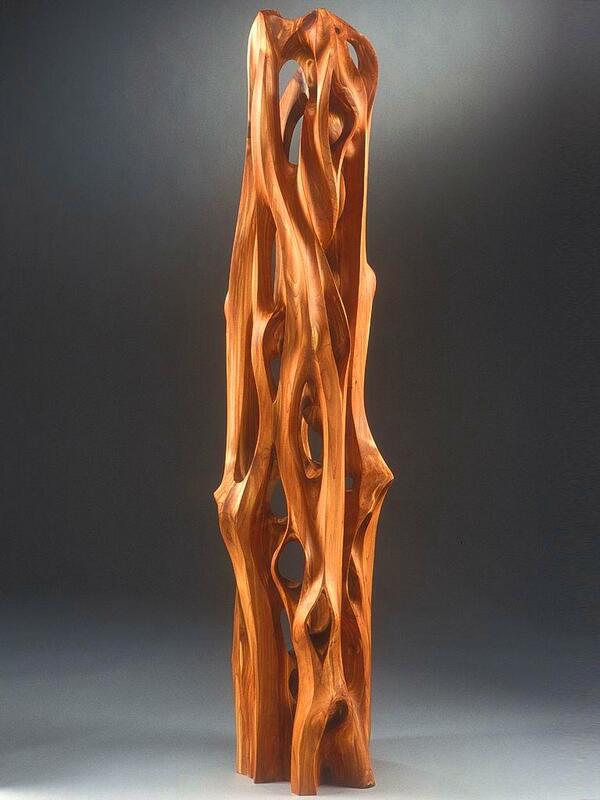 As the design for this monumental wood sculpture emerged, I chose the title Passages Into the Void so that the viewer might have a sense of the meditation that is my work. On a regular basis, I assign my left brain a logic or math problem to solve and, while the left is distracted, the right brain slips into that wonderland that is the source of creativity and inspiration. It is my own private play land, where time and our so-called reality do not exist. When most artists talk about partnering with the work, this is what they mean. And this piece reminds me of that other dimension or realm. There are endless access points or routes to get from the outside to the inside or from one side to the other. It is all around us. And accessible to all. If you have ever had the experience of trying to remember someone’s name and, try as you might, can’t, then when you let go of trying, the name suddenly comes to you. That is it! That is the gift that is there. That is where I go. But when I do, it is for extended visits. And I often miss meals.